Anyone crossing for the first time the San Francisco-Oakland Bay Bridge will probably outright develop nagging fears that Yerba Buena, the tiny-hill island serving as mid-support of the eight- and one-fourth mile steel structure, might one day sink under the weight stress of the longest bridge in the world. If others do not share this thought, then my experience is rather an exception. But since last August 22, my illusion has shifted from the steel giant weighing 275,000 tons to a human giant scarcely weighing 165 lbs.—Fleet Admiral Chester W. Nimitz. For on that day I learned through an exclusive interview that living there is the Fleet Admiral—who, on account of his role in winning for his country the Pacific War against Japan during the last world war, had earned for himself a distinct place among the moguls of naval commanders. The author at right interviewing Fleet Admiral Chester W. Nimitz August 22, 1964. Taken in the Fleet Admiral's Study in Quarter No. 1 at Yerba Buena Island, adjoining Treasure Island, in the San Francisco Bay. It was nine o’clock in the morning. Visibility was low. The weather was quite balmy as though winter was about to set in. The sight of heavy sign in black, “Quarter No. 1”, added assurance to the presence of two officers who, after seeing to it I was the right visitor getting into the restricted area, escorted from the sentry the cab I was riding in to make sure that I get into the right place. Quarter No. 1 was the address given me for the appointment. With some hesitation, and mixed feeling, I pressed the button at the door. Instantly it flung open. Another officer, clad snappily in his service formal uniform, briskly stood by from the inside with ready words, “Good morning—are you Mr. Doroquez?” I gave him the answer. Then he ushered me into an elaborately appointed waiting room. Before I could complete an inquiring look around, an elderly feminine voice broke in approaching me from a flank door. We exchanged greetings and niceties. Then she said, conducting me to another room, “Come on. The Fleet Admiral is right there.” She was Mrs. Nimitz. Indeed the Fleet Admiral was already in his study room, running down the morning papers. 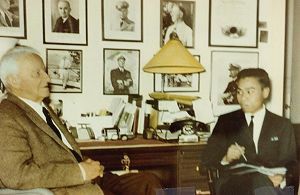 He was in light-brown sports coat, contrary to what I had always thought—that he is always in white official uniform (as I could imagine him sitting side by side with President Franklin D. Roosevelt, General of the Army Douglas MacArthur, and Admiral William D. Leahy at Pearl Harbor one day in July 1944) when receiving a visitor. He wore no lenses as though not reading at all. For, I in silence seemed to speak to myself, if indeed he was reading, an old man of his age could hardly do it without thick glasses. The sight of his silver-white hair and his wrinkled face all added to my impression. But when he glanced at me, I could not mistake his penetrating vision. These two contrasting impressions I was able to settle later only with a direct question. After a warm handshake and brief informalities, he settled on his swivel chair, asking me to take seat also. Of course he knew I wouldn’t be there at nine o’clock that morning had he not chosen the time to meet me, in like manner as he knew the purpose of my visit. I previously wrote him a letter explaining that I wanted to talk with him on the subject of Leadership in conjunction with a paper I was preparing for a graduate seminar course in Production Management. I immediately began firing questions directly focused on my subject. The 79-year old Commander-in-Chief of the Central Pacific Fleet—the single largest naval unit ever put together under one command in the course of WWII—took a good look at the wall in front of his study desk. He directed my attention in some ponderous way to the array of portraits of leaders hung there, both civilian and military, to give me a complete idea of the chain of command in the Central Pacific Ocean Theater which was the area of responsibility of his Fleet. I could see him more intimately. His blue eyes were quick, his reflexes flashy, yet definitely modest in everyway. I marveled about his humility in contrast to his achievements, his brilliant record as a student at the U.S. Naval Academy in Annapolis, and his fame which to others could easily give rise to pomp and flamboyance. “Here is a man,” I could not hold it to myself alone, “without whom the brilliant leap-frogging campaigns of his counterpart in the Army, General Douglas MacArthur, would have been rendered next to impossible, or probably without whom the history of the war in the Pacific might have been written entirely differently." Our formal conversation on Leadership lasted fifty minutes. The rest of the eighty-minute interview was on subject of general interest. He spoke of leadership in dept to my delight and satisfaction. However, the discussion is probably too technical for purposes of this article. But by the same token, one thing of general significance was certainly when he told me that he always set the example to his men. And he did not “set the example to the extent of pretense and bluff, where other leaders or commanders, in the name of authority and leadership itself, hypocritically refuse to give way to their human limitations.” Thus it was not uncommon that he would not only hesitate to take but even seek advice from his subordinates. After shooting all questions I had on Leadership, I backtracked to ask questions about his sight. The Fleet Admiral told me that he reads the newspapers and his favorite books without using any lenses. He reached by his left hand a book entitled “Navy Manual on Sea Power” and scanned the pages looking for what turned out to be footnotes. Upon seeing one, he read the fine prints so fast that it heightened my amazement. The prints were apparently of six-point fine. How do—or when young, did—you take care of your eyes, Admiral?” I asked. To a question I asked why he prefers living at Yerba Buena to his fabulous home in Berkeley, he replied that he and his wife “like it here better.” He could smell the sea breeze and observe at close range “the boys” train with the light cruisers in Treasure Island. Likewise, he could watch from time to time jubilant young sailors returning home with their aircraft carrier from tour of duties overseas. The Fleet Admiral—five-star, like a General of the Army—is not retired in view of his rank. He is on active duty without assignment. And he has an office maintained by the U.S. government in the federal building at the corner of Leavenworth and McAllister streets in San Francisco. But for all practical purposes he can be regarded as retired. Nonetheless, in spirit he is still an eager participant in the Fleet. He has become a part of the Navy and the Navy has become a part of him. This is another reason why he lives in the tiny island. Respecting success, the Fleet Admiral does not believe that a given individual is predestined to succeed simply because he was born with a silver spoon in his mouth, in like manner that he does not subscribe to the stereotyped notion that a leader is born—not made. He is of the belief that determination and industry are the determining factors. This, when augmented by a reasonable woman behind the man, can securely make a man ride on the crest of success. Of course the Fleet Admiral must have in mind his own example. By birth he was poor. He even had to work as a janitor and hotel clerk in order to get through high school. His career is by any means a chance. As a poor boy, he was utterly hopeless for a bright future. When the first light of hope beckoned on him, it was of going to the US Military Academy at West Point only to find himself later attending the US Naval Academy at Annapolis. This was on account of the fact that the congressman from his district in Texas, the only person then who was in a position to give him the break, had only an unfilled quota for the naval academy. But soon after he was admitted to the academy, he proved his academic aptitude so that he was graduated seventh in a class of 114. The man destined to become first of his rank in naval history was in the making. To my question of what he considers his greatest achievement, he pointed out not one. He emphasized that one achievement or the other has contributed to the attainment of another. One success would not have been made possible without the others. The Fleet Admiral says, however, that—considering the fact that the U.S. three aircraft carriers had to face six Japanese aircraft carriers—Midway was won by a combination of luck and the skill of the U.S. seamen and aviators. Of course the canning of the immediate commander, Admiral Raymond Spruance, under the Fleet Admiral’s command, was the determining factor. Also, weeks before the Japanese attacked, the U.S. Navy was able to ascertain that the Japanese was going to invade Midway. The Fleet Admiral’s headquarters in Hawaii were able to intercept the Japanese coded messages on the impending attack. But his men were not certain of the target. To pinpoint the target, Nimitz ordered a broadcast in plain English that Midway was short of fresh water. Then the Japanese in their in-fleet coded dispatches pointed out that their coded target was short of fresh water. Fleet Admiral Nimitz said that did the trick. He immediately instructed his commanders to prepare on how to meet the enemy. In complexity, as well as in importance, he considers the Battle of Leyte Gulf without parallel in the annals of naval history. Moreover, its loss by the Japanese also cut off the East Indies (now largely Indonesia) the flow of raw materials that Japan needed to feed its war industry. Augmented by the A-Bomb, the effect of the Battle of Leyte Gulf and the reconquest of the Philippines by MacArthur left Japan no other alternative in the later months but surrender. I asked the Fleet Admiral how he would compare General of the Army MacArthur to General of the Army Eisenhower. Nimitz, referring to MacArthur, said, “Super, super.” When I urged him to elaborate, he said, “Here is how I can put it briefly: When you are a soldier and you are under MacArthur, you fight for MacArthur. But when you are under Eisenhower, you fight because you are a soldier. And,” speaking with a grin, “when you are a sailor, you are either with the U.S. Navy or with the ‘MacArthur’s Navy’ (a deriding reference at the Pentagon to the Seventh Fleet in WWII which was MacArthur’s mainstay in his leapfrogging campaigns in the Southwest Pacific for his effort to return to the Philippines)." “Watch,” the aging Fleet Admiral whispered to me, “one humming bird will alight at the twig to sip the liquid sugar in the bottle. Then another will come and take its turn also.” That curiosity added to my suspense and marvel about the man. Love of nature is just another facet of his life. Outside the porch, there was also a mounted telescope. He then invited me outside to view the San Francisco Bay through the instrument. We stood together for a moment, he admiring lavishly the verdure of the lawn and shrubberies around, with the flowery scent of the drying mist carried by gently moving winds from Yerba Buena hillside vines and pine trees adding to the pleasant morning. He went to the telescope, I following him, and peering through it he trained it around. He did not give any description of what could be seen, pointing out, however, that on clear nights he loves scanning the stars. Instead, he gave me the device to see for myself what might be of interest to me. I must admit it was my first time to peer through that type of telescope. But what fascinated me was not just the device itself. Neither alone was the legendary panoramic view of the San Francisco Bay. What delighted me the most was the thought through the lenses that from time to time finds way around the vision of a man whose achievements are no more manifest than the modern and varied structures east and west of the tiny island. To the east, Oakland; to the west, San Francisco. There might be, without him, the majestic and towering Kaiser Center in Oakland or the reassuring monstrosity of an aircraft carrier moored at the distant Alameda naval station or the spectra of the Bay Bridge itself and the skyscrapers in downtown San Francisco, viewed from here and afar. But chances are that, without him, they might be there flying the “rising sun” or with the touch and traces of Ginza. 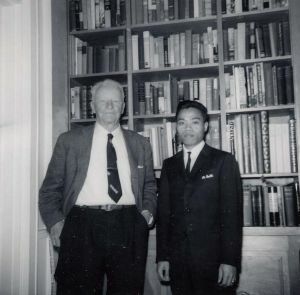 The author with Fleet Admiral Chester W. Nimitz in the Fleet Admiral's Study Library August 22, 1964. Taken in the Fleet admiral's residence study, Quarter No. 1, at Yerba Buena Island, adjoining Treasure Island, in the San Francisco Bay. While the Fleet Admiral was peering through the telescope, the thought of Napoleon suddenly came to my mind. Could Napoleon have been peering around through a telescope at St. Helena? That was the inquiring though I had. And sure Napoleon was even without a telescope. But his sights, as against that of the modest-looking man before me, were no real sight of his self-centered deeds. They were the real sights of the boundless horizon of the South Atlantic, whereupon abounded —as an intervening image to his crippling loneliness— the visions of himself in Egypt, in Trafalgar, in Paris, in Belgium, in Austria at the Battle of Austerlitz, in Russia at the Battle of Borodino, etc., as master of those lands. But then those were no less the illusions of a frustrated and doubly lonesome man. I turned upon my watch. I was still bewitched by the charisma of one of the greatest naval commanders of all time. His fatherliness, his sharp mind, his humility, his eagerness to impart his wisdom upon young people like me—back dropped by the thought of his illustrious career and remarkable achievements—all were blending in me into an impression which now has taken the place of my delusion about the imposing San Francisco-Oakland Bay Bridge: that a truly great man is humble and without affectation. But my time was over. I had to bid everybody goodbye, including and fondly so to the Fleet Admiral.